Immune System Dysfunction Is The Greatest Threat To America's Health Today! Diseases such as Cancer, Hepatitis, and Lyme disease are at least partially caused by our immune systems inability to correctly identify and destroy the aberant cells and invaders. GlycoEssential 7 with OMC is the most effective immune system enhancer yet developed! Try it yourself and see! 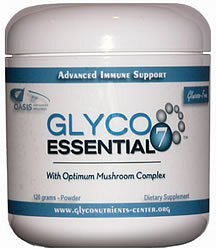 GlycoEssential 7 is the first Advanced Immune Support glyconutrient product containing seven essential sugars plus added Optimum Mushroom Complex (OMC) to provide ultimate immune enhancement and support. GlycoEssential 7 is glucose-free making it the perfect support for any health concern.